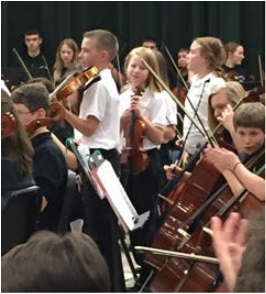 To put it simply the Tecumseh Schools Orchestra Program began as an answer to a dream. Herself a violinist and violin teacher, one of Elizabeth’s fondest dreams was that Tecumseh would include a string program in the public school system. To that end the Foundation has worked closely with the schools and a committee of dedicated community members to provide the opportunity for students to be enriched by string playing. Research continues to support this dream, showing the benefits to academic progress, brain development and ability to work as a team that instrumental music provides to children. The initiative really took off in 2003 when Mr. Bob Phillips, renowned string educator and composer, agreed to start up Tecumseh’s program following his retirement after 27 years in Saline Schools. Because there was no way to add the string class into the already packed school day, forty 4th grade students agreed to meet every morning before their school day began for a 45-minute class. Under Mr. Phillips instruction those forty students exceeded the initial expectations of the foundation. The string program was an astounding success. In its second year the program expanded to include 95 4th grade students in the beginning string class – more than double the first year’s class – and 36 returning 5th grade students. The second year also brought about the hiring of Mrs. Amy (Feldkamp) Marr as Mr. Phillips retired-for the second time. Now the program is run by Mrs. Marr and is thriving under her instruction. The TSO program has approximately 350 students enrolled each year. The program is proud to have many former students currently pursuing careers in music! The Foundation’s (and Elizabeth’s) dream has been realized! The TSO has grown into a comprehensive program which reaches students from 5th through 12th grade. Wesley and Theresa Powers were long time friends and neighbors of Elizabeth Wilson. The couple honors Elizabeth's memory in their steadfast dedication to the TSO program. In the early years Wes and Theresa were instrumental in the success of the program. They helped with many facets of the including helping to organize the first camp, hauling instruments to concerts, hosting the TSO's annual yard sale and so much more! Mr. and Mrs. Powers are still present at many TSO events and are proud of the TSO students. To recognize dedication to the program, Wes and Theresa offer a scholarship to one graduating TSO student each year.